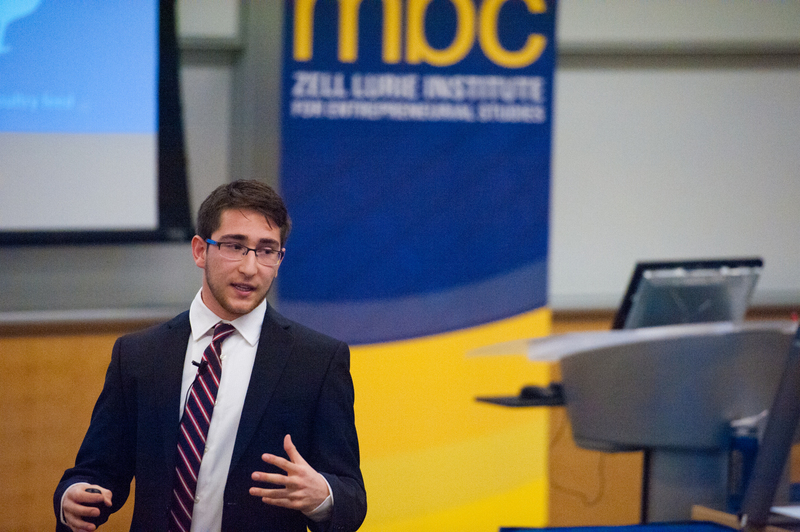 The Zell Lurie Institute for Entrepreneurial Studies kicked off Round 1 of the 34th Michigan Business Challenge (MBC) with over 200 students pitching their entrepreneurial ideas. From this initial round, 20 teams were selected to compete in Round Two on January 20, 2017. 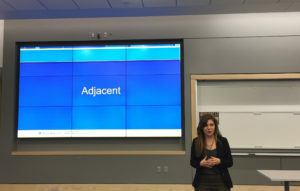 Adjacent is a mobile app that helps emerging entrepreneurs find local co-founders, mentors, and supporters and build them into a personalized community. At AIM tech, we desire to improve health care options for underserved groups on a global scale through the development of safe, user-friendly, low power, and affordable equipment. ArborThotics enables a new process to manufacture cost-effective custom orthoses faster than ever before. Carrycott designs baby strollers to make family outings more delightful. Flexscle is a wearable device that measures real-time muscle activity and analyzes these biosignals to provide custom training suggestions to help users avoid injuries and enhance outcome performance. Gwydion produces high-quality virtual reality and augmented reality software that fits consumer niches, and generates synergy between the realms of entertainment and utility that further utilize the untapped potential of virtual and augmented reality hardware. Kladder is an online and mobile application that connects diverse professionals and offers unique industry insights based upon the experiences of these individuals. Kulisha is a for-profit agriculture technology (agritech) company that is developing a proprietary system that enables organic waste management organizations to inject black soldier fly larvae (BSFL) into their processes. Morning Brew is a daily email business newsletter geared towards young business professionals. Moxytech has created GeoPain, which offers a user-friendly, device-agnostic software solution for tracking, analyzing, and communicating the details lost with existing pain assessment methods. Performance Pressure Partners develops and sells a safe and efficient marijuana extraction machine to legal marijuana extract processors. RPNI helps amputees relieve the pain of the phantom limb while at the same time giving them control over their prosthetics. Creating private blend cosmetics for medium skin tones. SmallWorld strengthens communities by facilitating high-quality connections between community members. Statum leverages our proprietary and patentable technology to provide precise, scalable, and affordable indoor positioning to our customers. Thrive is the CPG company of the future, providing healthy, fresh snacks using food from local farmers. Wear and Share gives college students looking for new clothing options access into closets across campus. 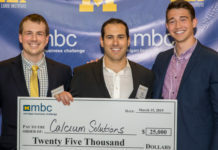 Competing teams in Round 2 of the Michigan Business Challenge give a seven-minute presentation that describes their entrepreneurial solution to a pressing market need or pain, an estimation of the market size, and their financial assumptions. Ten additional teams will advance to the Michigan Business Challenge Impact Track Semi-Finals. 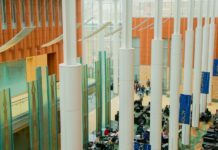 Hosted by the Center for Social Impact in partnership with the Zell Lurie and Erb Institutes, the Impact Track supports the creation of new businesses, products, or services that promote social or environmental impact. Chevuru uses data science to inform farmers’ agricultural decisions in developing countries to reduce suicide rates and debt risk while improving living standards. Find Your Ditto is a mobile application that connects individuals living with chronic illness locally for on-demand, in-person peer support. Using both a website and smartphone app, FoodFinder is a tool that delivers valuable information to food insecure children and their families to let them know exactly when and where they can receive free food assistance from resources such as food pantries, food kitchens, faith-based institutions, and co-ops. A Peer-to-Pool-to-Peer community platform that incentives savings, while providing low interest loans during times of need, all of which is kept in check by social capital between pool-members. Reco is an exchange for donations of surplus inventory. Sage & Grace is a website and concierge service that educates and empowers grieving families to better, and more affordably, navigate the complications and stress of the American funeral planning process. Throughout multiple rounds of competition, student teams present their plans to leaders from the areas of entrepreneurship and venture capital. The winners from Round Two will advance to the MBC Semi-Finals in February. Select teams will then move forward to the Michigan Business Challenge Finals and compete for more than $85,000 in prizes. 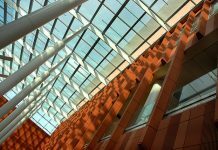 For more information on the Michigan Business Challenge, visit: http://zli.umich.edu/programs-funds/michigan-business-challenge.